Dominic Monaghan (Merry); Elijah Wood (Frodo); Billy Boyd (Pippin); Orlando Bloom (Legolas); Sir Ian McKellen (Gandalf); Liv Tyler (Arwen); Viggo Mortensen (Aragorn); Sean Astin (Sam) and his daughter Alexandra Astin (Eleanor). In the background is one of Air New Zealand's four themed aircraft depicting images from the three movies. The Aragorn / Arwen Boeing 767 depicts Viggo Mortensen (Aragorn) and Liv Tyler (Arwen) set against the stunning backdrop of the Remarkables mountain range near Queenstown, New Zealand. 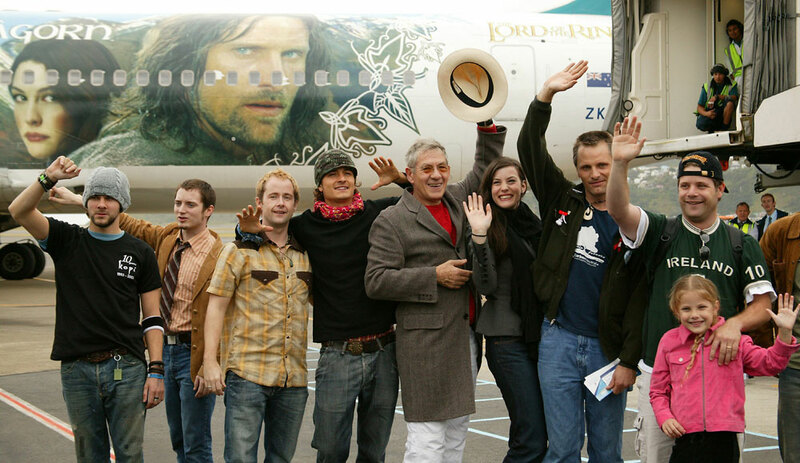 Following the photo shoot, cast and crew then flew in this aircraft from Wellington to Auckland to connect with their international flight to the USA in time for the Los Angeles premiere of the Return of the King on Wednesday, December 3.